Arnotts VitaWeat Biscuits 9 Grains are one of our standbys. Each biscuit is approx 8 grams and 100 kj or 25 calories (3 per gram) so that about 6 biscuits (150 calories) plus some nutritious topping makes an adequate lunch. We store them in lightweight plastic freezer portion containers to prevent breakage. I have already mentioned peanut butter as an excellent topping (See: http://www.theultralighthiker.com/peanut-butter-toast-soldiers/) Another favourite topping is D’Orsogna Traditional Romano Italian Salami (which does not require refrigeration until opening – and we find keeps fine for the three days it takes us to eat in @ 20C temperatures – ditto the following cheese) and Mainland Noble Cheddar or Colby. The Noble is a delicious new low fat cheddar which you might find hard to source. Both salami and cheddar were invented (way back in the Middle Ages) for just such a purpose (ie long life compact food) and it is hard to beat them. 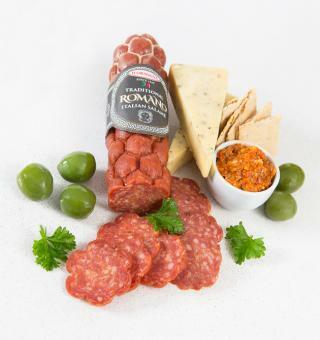 Both the salami and the cheese are over 400 kj or 100 calories per 25 gram serve (ie over 4 calories per gram). Della and I find that a 200 gram pack of cheese plus a 200 gram salami last us with 36 biscuits for three days’ lunches. Per day each of us is eating 67 grams of salami/cheese plus 6 biscuits 270 + 150 = 420 calories each , quite enough for a nutritious lunch on the trail! Another favourite lunch standby is Della’s Coconut Rice plus a sachet of tuna. (See: http://www.theultralighthiker.com/dellas-coconut-rice-hiking-food/) or if we want something hot one of the CupaSoup meals is great (For example: http://www.theultralighthiker.com/hiking-meals-continental-hearty-italian-minestrone/ Bon Appetit!